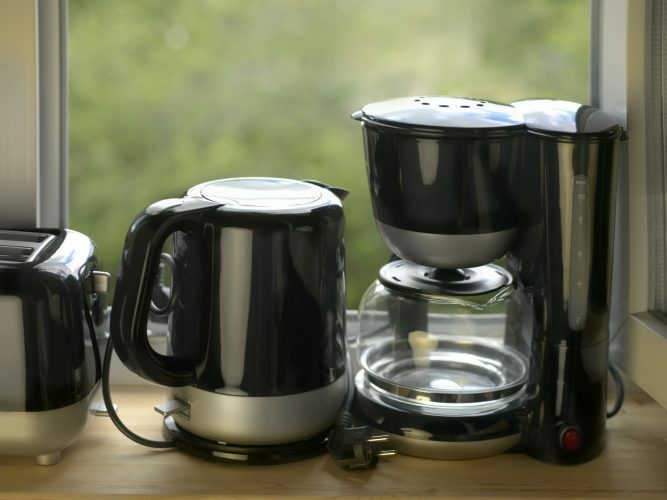 When trying to determine what is the best electric kettle, you need to consider a number of different factors. What material is the kettle made out of, what features does it offer, how much temperature control do you have. 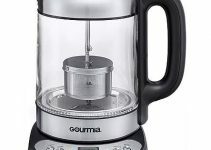 Depending on what you want, the answer to what is the best electric kettle can vary. So we’ve categorized 15 best electric kettles into three different price points to help you choose. These kettles will be fairly bare bones, not doing much more than boiling your water efficiently and effectively. However, if that’s all you’re looking for these kettles, priced between $15 and $42, will be perfect for you. The Hamilton is large, inexpensive kettle. The kettle reaches a boil very quickly and gives you an easy way to measure the amount of water to put in by liters. The kettle will shut off automatically after its boiling cycle is complete. Running at around $25 the kettle doesn’t come packed with features but will get the job done just fine. 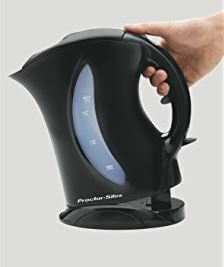 The Proctor Silex is a simple, yet attractive kettle that just gets the job done. The kettle utilizes a rapid boil system that heats up water quickly. It also features a variety of handy functions which include an on/off light, automatic shutoff, and boil-dry protection. The dual water windows allow for easy filling and the immersed heating element makes cleanup easy. If you’re looking for a durable kettle, the Proctor Silex might be for you. The Black & Decker Smart Boil JKC650 is a cordless kettle which features a 360-degree swivel base which facilitates easy filling and pouring. The hinged lid stays open and the water window lets you see the water level. However, the window can be on the smaller side so it can be hard to know how much water is in there at any given time. If you’re someone who measures out their water beforehand it may not matter to you. The kettle automatically shuts off once the water reaches a boil and the handle is slightly curved for easy grip and pouring. 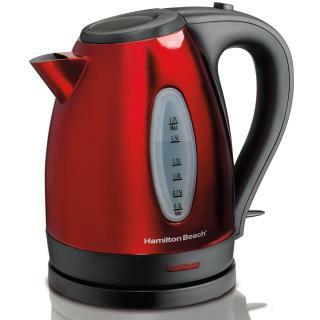 The candy apple red Hamilton Beach Compact looks somewhat like the tea kettle of your childhood. While most electric kettles nowadays feature handles on the side and a verticles design, the Compact goes for the traditional look. The handle is on the top and the kettle itself is a roundish shape. This design does make it somewhat trickier to pour if you’re used to the more modern designed kettles. With the handle on the top and a short spout, there is always a risk of excess drip or splashing. However, if you know your way around this kind of kettle the Compact combines modern quick boil technology with a nice traditional look. The Presto Electric Tea Kettle keeps things sweet and simple. A built-in whistle signals when water is boiling. The large no-drip spout makes. The large no-drip spout makes filling the kettle and pouring water out safe and easy. A flip-up stainless steel lid keeps the steam away from you while you pour. These kettles, ranging between $50 and $100, give you more options in terms of temperature control and a boost in durability. The gooseneck design makes pouring a breeze. Anyone familiar with pour over knows how important it is to saturate the coffee right in its center. The temperature controls are also incredibly precise, with options between 140 and 212 degrees. The kettle can hold this temperature for up to an hour, which is ideal for people who look forward to brewing another cup without the wait to reboil the water. The Cuisinart is considered by many to be the sports car of the electric kettle. With a sleek design and an intuitive interface, the Cuisinart will fit right into your modern kitchen. The kettle offers six preset temperatures settings, 160°, 175°, 185°, 190°, 200°, and Boil, which are presented as buttons on the handle along with a Start button and a Keep Warm option. Once you select the temperature you want the kettle will boil the water and then automatically switch to its keep warm mode for the next thirty minutes. The Cuisinart boasts an extremely fast and consistent boil time, being able to bring a liter of water to boil on an average of four minutes. The Capresso H20 is all about style. Featuring a clear glass container, you will be able to watch your water begin to bubble as it boils. The kettle holds just over six cups of water and will automatically shut off once it reaches a boil. The Capresso also features a quick boil time, with just under four and a half minutes. However, there have been some complaints about its durability past the one year warranty. The plastic lid on the top as well as the other plastic components of the kettle does not hold up well after sustained use for a long period of time. The Epica offers six different temperature settings with provided instructions as to which temperature works best for what beverage. The kettle also features a keep warm options that will work for up to 30 minutes after the initial boil is reached. The handle will always remain cool, no matter how hot the kettle gets, and the lid will open automatically if you don’t have an extra hand free. The BELLA Ceramic Kettle is a timeless piece. Made almost entirely of ceramic and designed with the look of a traditional tea kettle, the BELLA is a nice addition to a traditionalist’s kitchen. The kettle is simple enough to use, simply hit the switch on its detachable base to boil the water. The gooseneck spout helps contribute to the overall aesthetic of the kettle while also providing safely controlled pours. The all ceramic material also helps with the kettle’s durability over the long term. 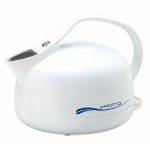 These electric kettles are for those who want to use their kettles very frequently or for a specialized purpose. They’re expensive, ranging from $100 to $400, but they’re built to last. The SmartKettle allows you to choose your water’s temperature, anything from 122 to 212 degrees. It comes in a stylish, stainless-steel jug that will keep your water warm up to an unspecified amount of time. The precision offered with this kettle is what makes it unique. Not many other electric kettles on the market will allow you to specify your temperature. If you’re picky about things like precise control over the temperature, consider the SmartKettle for around $100. If you’re going to be using your electric kettle to mainly brew tea and price is no object, this may be the kettle for you. The Breville Tea Maker not only has buttons that will brew the correct temperature for oolong, white, green, and black tea but also contains a carafe that will brew the tea as well. Simply fill the kettle with water and load the carafe with your favorite tea. The kettle will lower the carafe into the boiling water and steep it for the ideal amount of time. In no time you will have a pot of freshly brewed tea, made by one all-encompassing kettle. The settings for the kettle are customizable as well, so you can determine how long you want your tea to steep. In other words, you can choose how strong you want your pot of tea to be. You can preset the kettle to brew your tea for a certain time so you can wake up to a nice cup of green tea to start your morning. The Breville Tea Maker also functions as an extremely effective electric kettle in its own right, simply choose the hot water option to boil water by itself. The kettle is a powerhouse and can boil with the best of them, boasting a keep warm time of up to one hour. The price on Amazon makes this a premium item. But if you’re serious about your tea drinking, it might be worth the investment for you. The Teforia Leaf Tea Infuser works exclusively with Teforia’s selection of artisanal teas. The Infuser will read whatever Teforia tea bag you want to use and will automatically optimize itself for the ideal brewing recipe. Teforia offers a wide range of different teas, so it might be a good investment for tea enthusiasts who like to try new things. Because the Infuser is built to specifically make Teforia tea, the brewing process is among the best you’ll find in the electric kettle market. The Infuser is not cheap. It would be smart to make sure you enjoy Teforia’s selection of teas first before purchasing. If you’re someone who enjoys Teforia tea, there is no better kettle on the market than this one. The KitchenAid Kettle has a dual wall body that provides insulation that helps keep the water temperature hotter for longer while keeping the outside cool to the touch. The temperature is controlled by a sliding mechanism that allows you to choose a temperature between 50 and 100 degrees Celsius. You will be able to read the temperature of the water in the kettle with a handy water gauge on the outside of the jug. 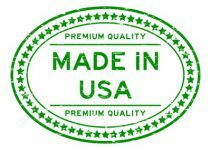 The kettle is also backed by a five-year limited warranty and is built to last. The candy red apple color adds to the kettle’s vintage styling. Passionate tea drinkers know how important the water temperature is to brewing different types of tea. Which is why the Breville Kettle is a match made in heaven for tea drinkers. Featuring five preset temperature options for green tea, oolong tea, black tea, white tea, and french press, you will never have to worry about whether or not you have the right water temperature to make the perfect brew. Like the other top tier kettles, Breville has a keep-warm setting that will maintain the water’s relative temperature for up to 20 minutes. The kettle also looks as powerful as it is, boasting a stainless steel design that will turn heads. In terms of pure water boiling, the Breville is the answer to what is the best electric kettle overall in our opinion. But it’s worth its weight in gold if you value a cup of oolong tea that tastes exactly the way it should. So What’s The Best Electric Kettle? That all depends on you and what you’re looking for. Whether you want something cheap yet durable or decadent and packed with features, the list above should have something for you. Now that the question of what is the best electric kettle is settled, all that’s left is to fill it up with water, set the boil, and get to brewing. Great review of electric kettles! I appreciate having all the facts in one place so an informed decision can be made. I am usually a mid-price kind of guy, so I am looking at the Bella Ceramic kettle most likely. I like the quality and traditional look to it. Which kettle do you have? Thanks for taking time to write a comment. Bella Ceramic is a good choice. I have now the Cuisinart CPK 17 PerfectTemp kettle, and I must say I love it. If you decide to buy the Bella Ceramic kettle, please come back here and share your impression about this beautiful kettle. Hey, thanks for this post. I was most excited to see the cordless option. I prefer an electric kettle (for safety reasons so that my kids don’t leave the stove on) but have only found ones with a cord. The cord irritates me, just from a tidiness vantage. Which kettle do you use? Do you have a favorite, or do you have family members that feel strongly one way or another? Thank you for taking the time to write this comment. Safety is very important when you have children. My kids always try to play with the stove. It’s time for you to buy a cordless kettle. I recommend you the one I use now, the Cuisinart Perfect Temp. Is awesome.You will love it. Which kettle do you use and how satisfied are you with it? Thanks for the information regarding kettles. My stepmom really loves using kettles to make her coffee. I recently purchased her a coffee maker and she hated it. So I have been looking to find her a better kettle for her kitchen since she does so much for me and my family. This article has opened my eyes to the possibilities. Thank you again for the helpful information. Glad to be helpful. I recommend you the number 9 from the list above, as I use it and I am very pleased. Please come back here after you buy her a new kettle and tell us what type is and how she likes it. Very nice and informative review of each kettles. you have written amazing information about all the kettles. Thank you for your appreciation! I am happy to help!